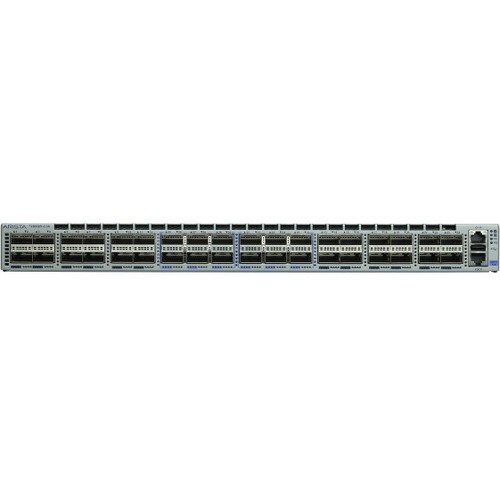 The Arista 7280R Series are key components of the Arista 7000 Series portfolio of data center switches. The Arista 7280R Series are purpose built fixed configuration 10/40/100GbE systems built for the highest performance environments, and to meet the needs of the largest scale data centers. They combine scalable L2 and L3 resources and high density with advanced features for network monitoring, precision timing and network virtualization to deliver scalable and deterministic network performance while simplifying designs and reducing Opex. The 7280R capabilities address the requirements for modern networking and rich multi-media content delivery requiring a lossless forwarding solution in a compact and energy efficient form factor. The 7280R can be deployed in a wide range of open networking solutions including large scale layer 2 and layer 3 cloud designs, overlay networks, virtualized or traditional enterprise data center networks. Deep packet buffers and large routing tables allow for internet peering applications. The broad range of interfaces and density choice provides deployment flexibility. The 7280R Series are available in a range of models with a choice of 10GBASE-T, 10GbE SFP+ with 40/100GbE QSFP uplinks and a range of 1RU and 2RU 40/100GbE systems that offers up to 48 ports of wire speed 100GbE in a 2RU system. 7280R support for 100GbE QSFP incorporates a flexible choice of interface speed including 25GbE and 50GbE providing unparalleled flexibility and the ability to seamlessly transition data centers to the next generation of Ethernet performance. The 7280R Series provide industry leading power efficiency with airflow choices for back to front, or front to back. An optional built-in SSD supports advanced logging, data captures and other services directly on the switch. Combined with Arista EOS the 7280R Series delivers advanced features for big data, cloud, virtualized and traditional designs. All Arista products including the 7280R Series runs the same Arista EOS software, binary image simplifying network administration with a single standard across all switches. Arista EOS is a modular switch operating system with a unique state sharing architecture that cleanly separates switch state from protocol processing and application logic. Built on top of a standard Linux kernel, all EOS processes run in their own protected memory space and exchange state through an in-memory database. This multi-process state sharing architecture provides the foundation for in-service-software updates and self-healing resiliency together with stateful switchover without the loss of data plane forwarding. Arista EOS enables advanced monitoring and automation capabilities such as Zero Touch Provisioning, LANZ, VM Tracer and Linux based tools to be run natively on the switch.